What has compelled me to write this article, is often the lack of foresight teachers, particularly in primary schools, put into setting up their rooms. As a relief/substitute teacher, I have, for example, found it difficult to get around the room to help students. White boards are often put to one side to allow the main central space for an electronic board. This prevents the easy use of the white board when any problems arise. This article discusses issues that the teacher needs to address to create the best learning environment in the classroom. 3. Making sure that every student can see and hear everything that is going on in the teaching situation. With these considerations in mind, you need to think seriously about the most appropriate place for the following physical equipment. (My suggestions follow each item). • The 'time out' desk. (This needs to be away from the rest of the class but in a position where the student knows you can see him/her in your direct vision and relatively close to you to allow you to easily check the work ethic of the student). Once you have set up your room and begun teaching, check that there is ease of movement, all the students can see and hear what is going on and that arrangement encourages a good work ethic and discourages inattention. If there is a problem with behaviour with the new arrangement, look for a slight re-organisation to stem the problem. It is important to realise that your seating arrangements must suit your selection of teaching pedagogues. In this modern era, teachers are expected to use a range of teaching pedagogues/strategies to cater for different learning styles so, below, are some classroom arrangement ideas to suit different teaching strategies. • For 'chalk and talk/lecture' lessons where you are using the board; desks lined up in rows give all students a clear view and allow the teacher to check that the 'message' is getting across to the students. • For an all class discussion lesson; a hollow square arrangement best suits. • For giving reports, marking rolls, giving information/messages or speeches, reading stories, morning talks; students sitting on a carpet works well in primary school. It gives the teacher the opportunity to teach students how to be a good audience. 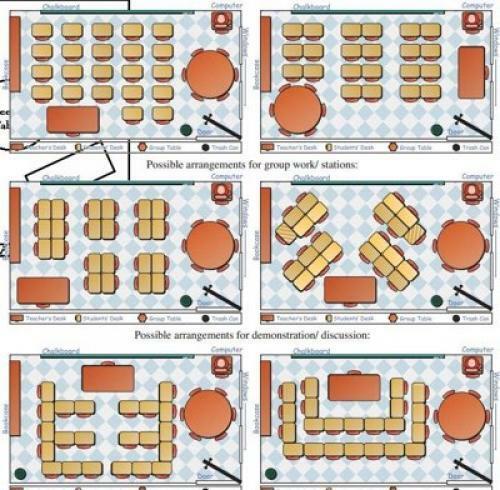 • For cooperative learning strategies; four desks in a square works best as a group of four students is the most efficient number for this type of learning. It also allows ease of movement for the teacher going to each group. • For testing; single desks in lines separated from each other allows the teacher to supervise easily. • If talking and distractions are rife in your class; use the testing arrangement to separate students. At the beginning of this article, I mentioned the difficulty I had as a relief teacher in some primary classrooms where the teacher had not thought through the best way to organise the room. Almost always, a badly organised room meant a badly behaved class. Conversely, a well organised classroom lead to a good work ethic and a pleasant classroom environment. It behoves all teachers to create the best classroom environment to encourage effective learning and a less stressful teaching environment for themselves. These eBooks are designed to give practical advice to teachers that he knows works at the 'coalface' of teaching. Further information on this topic is available in his eBook, "The Discipline Book".